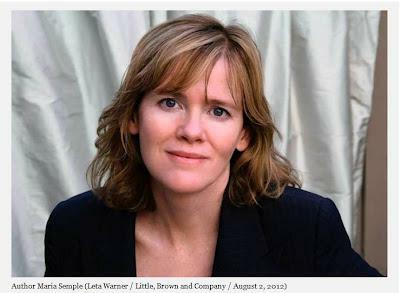 Recently I had the great pleasure of hearing Maria Semple, author of Where’d You Go Bernadette, speak at my indie bookstore. She was a hoot – funny, personable and inspirational. So much so, that I worked up the courage and asked her to share a few words with our blog readers. Nothing smells like charred popcorn, which is why I was thrilled Semple graciously agreed to answer my most burning questions. Q: I’m sure you are often approached by wannabee novelists, like me, who ask for advice on the craft of writing and the path to publication. What words of wisdom can you share with us? A: The craft of writing and the path to publication are two very different things, so I’ll address them one at a time. Read voraciously and write the book you want to read. A novel should be a tantrum of taste. Whatever you want to do with your novel, fully go for it. Don’t hedge. But while you’re indulging yourself, care deeply about your reader. Care that they’re not confused. Care that they’re entertained. Realize that your competition isn’t another writer. Your competition is the bedside table reading light. Make sure that the reader’s experience is even better than sleep. Resist the impulse to show your novel to anyone too soon. Rewrite and rewrite. Give your manuscript to your friends who are big readers. In other words, people who would conceivably buy your novel. The most important thing is to connect with a readers. Have them read the manuscript and ask them, “What was confusing? What was boring? What was missing? What felt repetitive?” Take their responses seriously. The earliest I’ll show anyone a novel is the third draft. I pick a few of friends who aren’t in publishing, have them read it, and give me notes. In my experience, they all generally have the same notes. Things that confused them, a character’s action that seemed to come out of the blue, parts that dragged, etc. And none of problems I saw myself, but once pointed out to me become embarrassingly obvious. They’re blind spots, and every writer has them. It’s critical that these get resolved before you give your script to a professional. Make sure your draft is the very best it can be before you even think about getting an agent. Show it to friends, get notes, put it in a drawer for several months, look at it with fresh eyes, show it to more friends, etc. If you think you need to hire a professional editor, do that. Hire a proofreader to clean up the typos. Throw everything at your manuscript you can think of to get it into shape. The reason to take this so seriously is because you only have one shot with agents and friends in publishing. If you give them something half-formed, you will not get the chance to go back to them with a rewritten manuscript. Their time is precious. Respect it. And then with agents– my advice is pretty much the same as you’d hear anywhere. Make a list of authors who are similar to you and then research who their agents are. Go to the agency websites and find out their submission guidelines. Follow these rules to the letter. This isn’t the time to get cute and creative. Q. In your trailer for Where’d You Go Bernadette you poke fun at the lackluster sales of your first novel. How did that experience affect you, and how were you able to move beyond this set-back? A. The failure of THIS ONE IS MINE was really devastating to me. I didn’t expect it. I realize now that I just didn’t know that much about publishing. I had no idea that the successful book is the rare exception. Most books die on, or even before publication. What happened to me wasn’t that big of a deal, but it felt like death. I didn’t have the strength to bounce back. I was sure I’d never write again. Ironically, the character of Bernadette Fox came out of this low ebb. It occurred to me there was something funny about artist who is unable to overcome failure and, because she isn’t creating, causes serious trouble to those around her. Q. Where and when do you do your best writing? A. I’m a mom first. I have no choice but to write between drop-off and pick-up. It gives my writing sessions a sense of urgency, which works well. Q. What do you wish someone had told you before you wrote your first novel? A. To cut out the swear words. I had a fair amount of bad language in THIS ONE IS MINE. I didn’t realize how prudish many readers were. I thought, hey, they read books, they can deal with a few fucks here and there. I’m still surprised by how many readers get to a swear word and utterly turn against the book. Even with Bernadette, which is a clean, upbeat book, I get many negative comments about its handful of swear words. Q. How is writing for television similar or different than literary fiction writing? A. Writing for TV is a group effort, for better and for worse. It’s fun, full of laughs, and always interesting because of all the personalities and drama. But you have no ownership over your writing. Your time is not your own. You’re at the mercy of network executives, actors, censors, etc. I much prefer novel writing. It took me years to find my form and now that I have, I’d never go back to TV. A heartfelt thanks to Maria Semple, from all of us at popcorn, for taking the time to contribute! I know. Who knew!? I was really fascinated by that as well. Thanks Adrienne! That line was a favorite of mine too. She’s so good. And thanks too for all your great feedback yesterday. It was very constructive! What a great conversation! I loved seeing her in person, and it’s fantastic to get these additional insights. Great interview…. love her style of writing…. I would say that mine is very similar. Thanks for sharing this with everyone ! Linda Rappoport said: I just self published my first novel. It was great to get your perspective on all the transitions you go through with a manuscript. I was aware of them, but it was uplifting to know we all have to go through the same process…even the pros.